Total price will be RM 11.50 . 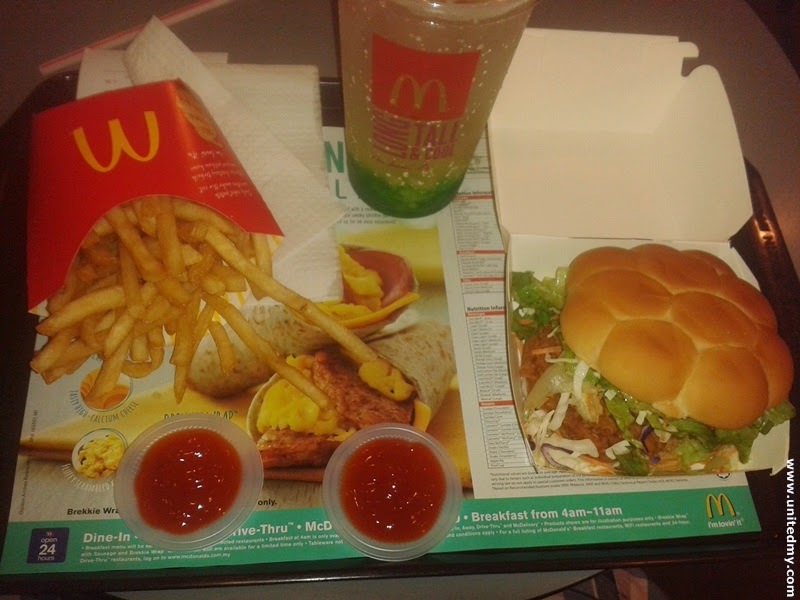 Habanero burger RM7.30 with fries + LimeMcFizz RM4.2 . I do not know where they get the name from Habanero, I am guessing it must be a Brazilian language. It is so spicy I felt like eating this burger like forever. I used to eat them quite fast. The size of the burger is satisfactory. I just don know why the McDonald staff did not give me the exclusive and limited FIFA World Cup french fries holder. I apparently ordered a Habanero burger. Is that only available for those who purchase large set Habanero burgers ?? I just want to try it out the McDonald FIFA game apps they had made. Without the limited edition French Fries holder, I think it pointless to play the McDonald FIFA game app right ? There were two choices available beef or chicken but both are spicy flavor. Cant they just Habanero burger original flavor ?? If it was not because McDonald is official restaurant FIFA World Cup 2014 and new Habanero burger, I would not convince myself for a meal trip there. Despite that, I think KFC got boneless chicken offer and I have yet to taste it. I am wondering whether McDonald Habanero burger or boneless KFC chicken. In the end, I would pick both it just the matter of time i will try both great offers. In case you just on diet and never been to McDonald lately, I have a news for you that every McDonald Malaysia outlets are your new modern mamak stall. You can watch LIVE any FIFA World Cup 2014 matches. If you are seeing this, Uruguay vs England 3AM in less than 11 hours from now.